Home /Website Design » What Are the Most-Hated UI Web Design Features? Are you using only the best UI Web Design features? We look at some unpopular web design features and the mistakes you could be making on your website design. Your website should be seamless and easy to read. Pages containing multiple graphs, links, pictures or overlapping texts create clutter and makes it difficult for users to navigate through. Be aware of bad colour schemes such as light text on a white background or text that are too small to read. Instead, the text should be an average size of 16 px or more and headings should be bold and well-defined. Avoid unnecessary links or irrelevant pictures. Correct content marketing is important to ensure that your website is effective in the digital age. Websites that lead to updated or outdated links can impact your business and prevent users from returning to your site. Ensure that links are not broken and that your social media links and contact details are listed clearly in the website on top of the page for quick access. Even the most corporate websites should contain engaging topics and a website that is fun for visitors to use. Adding a good design theme, bright pictures and easy to use customized buttons are effective in this regard. This will get users to stay and interact with your web design, as well as help your search engine optimization. 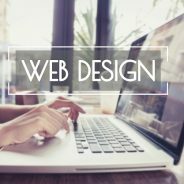 Need help with your Website Design or SEO Marketing? Then contact WSI OMS today.